Super high resolution 3D render of freeway sign, next exit… Productivity! Delivering getting more done in the same amount of time. That’s the Hoyl Grail of the productivity movement. I have studied productivity books, experts and courses for years. It has been a rewarding study and I look forward to sharing some of those insights with you. 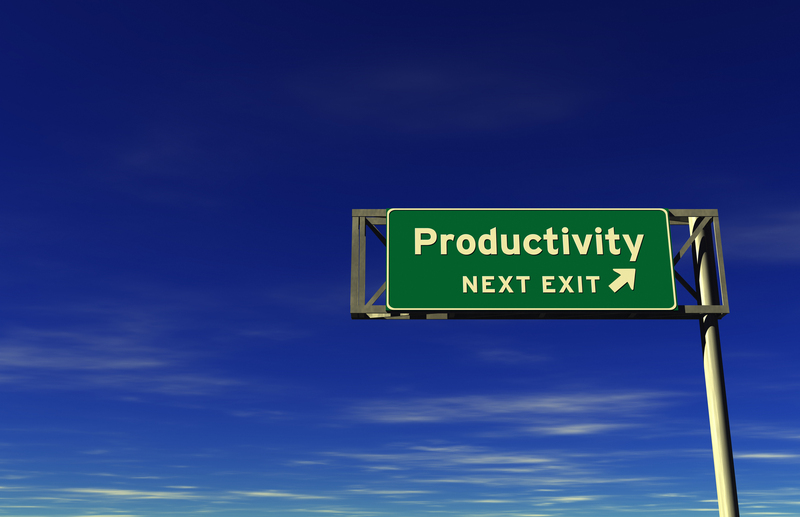 In this article, I will cover three enduring productivity strategies. As you read, look for one idea that will make a difference to your situation. You can always bookmark this article and come back later to read it. This definition of productivity points that that completing any random task is not productive. Most of us have goals – either assigned by someone else (an employer, a client or project charter) or created on our own. In addition, we all have guiding values we use to navigate through life. For example, if you value your health then it is productive to seek exercise, sleep and eat well. These three key points address the big picture of productivity. Without clarity on these points, it is unlikely you will ever feel you have “done enough.” My thinking on this point is shaped by the excellent book “Essentialism: The Disciplined Pursuit Of Less” by Greg McKeown.com which I read last year. Annual Review Process. Understanding what you are going to be measured on at the end of the year is helpful to know. For example, project delivery may be considered 80% of your role. The remaining 20% of your role might include providing support for corporate goals (e.g. community volunteer projects or brand promotion) or ad hoc assignments from your manager. “Stretch” Goals. If you are seeking promotion, it is vital to obtain and deliver against challenging assignments. Delivering one or two such assignments per year is a great way to improve your visibility and develop new skills. Career Development. Highly effective professionals have ideas for their career development. It could be a financial goal (e.g. earn $100,000 a year by 2017) or something else. Others may have the goal to become a freelancer or entrepreneur to achieve greater schedule flexibility. We all go through different seasons of life. The life of a single twenty five year old new professional is fairly different from a forty five year married professional with children. What we do at work matters. The rest of life matters even more. So take a few minutes to consider your season of life. 3. What Can You Stop Doing? Elimination of low value tasks and distractions is vital to becoming more productive. However, this is also the most challenging principle! Why? To stop doing something, you have to say no. Fortunately, it is easier to say no to tasks, projects and activities when you have put some thought into the above points. Automation. Using an automated method to accomplish tasks means less dull work for you. In the personal finance context, you can allocate a fixed percentage of your income to go into investments each month. That practice saves time and tends to improve your results. In the work context, you may write some Visual Basic code to automate producing an Excel report. Elimination. Saying no is the core of elimination. As I write this article in December, I have started to see people go through year end cleaning routines. Throwing out old papers and files creates greater mental clarity for many people. Other possibilities include revisiting your participation in corporate committees and volunteer groups. Managing York Work & Capacity. If you are a manager, team lead or project manager, you have tasks that you could assign to somebody else. For example, you may delegate a financial analysis project responsibility to someone else on your team. Delegation gives that person the opportunity to learn new skills and gives you additional productive capacity. Productivity is a vast topic and there are plenty of great resources out there. Here are some suggestions to help you continue your productivity education. Productivityist. Created by fellow Canadian Mike Vardy, Productivityist is a great productivity blog and training resource. Earlier this year, I wrote The Most Important Trait To Boost Your Productivity for the website which explains how to improve productivity through lifelong learning. The Four Hour Workweek by Tim Ferriss. Reading this book for the second time in 2014 was a key inspiration for founding Project Management Hacks. For added resources, I recommend listening to the Tim Ferriss Show podcast. Ferriss has interviewed highly accomplished people in many fields and draws interesting lessons from them. Getting Things Done by David Allen. This classic book is simply a must read. I have written before about the value of the Weekly Review, a great practice that I learned from David Allen. What did you find most valuable in the article? Just a brief and first reflection after reading.